Happy Monday! I don’t pay too much attention to banned cards because, well, banned. M-X-Saber Invoker still looks cool though. It’s a Rank 3 Earth Warrior-type XYZ Monster with 1600 Atk and 500 Def. None of that really matters except Warrior for Isolde and generic Rank 3 for ease of properly summoning. Once per turn, you can ditch a material to Special Summon a Level 4 Earth Warrior or Beast-Warrior from the deck in Def position. The new monster is destroyed during the End Phase, but I’m sure it will be used long before it gets a chance to die. Def position doesn’t matter either because the new monster can use any of its effects. Many possibilities are opened up with this in many decks that have nothing to do with X-Saber. As such, it was banned, (but not Isolde?) However, I think M-X-Saber Invoker will be back. If Card Destruction and Morphing Jar can come back, anything is possible. Banlist week this week, as last week the new Forbidden and Limited List went into effect, we will look at some cards affected by the list, starting off with the newly banned M-X-Saber Invoker. Invoker is a Rank 3 EARTH Warrior XYZ with 1600 ATK and 500 DEF and requires two Level 3 Monsters as materials. I’ve seen better stats on nearly every Rank 3, but that’s whatever, the summoning requirements are generic and there have been many easy ways to XYZ Summon Rank 3 monsters (Terrortop and Tour Guide come to mind), EARTH and Warrior are really good. Once per turn, you can detach 1 material from this card to summon 1 Level 4 EARTH Warrior or Beast-Warrior from your deck in Defense Position, but destroy it during the End Phase. This has been used a ton over the years, so not shocking that it eventually got banned. Madolche loved this card to get Messengelato out of the deck hopefully with Mewfeuille or Hootcake on the field, several FTK decks used this with Amazoness Archer (which why is that still legal to be honest along with the Cannon Soldiers? ), it eventually saw some meta play with Zoodiacs to get Ratpier out of the deck and do the Zoodiac things, and just this year it was used in Gouki to get Suprex out of the deck and make an easy Isolde with a Suprex search along with Isolde’s benefits. Invoker has been a combo extender for many different decks, some were top tier, and has been used in some Amazoness Archer FTKs, so I guess it was bound to get banned. The Defense Position or being destroyed in the End Phase never really mattered, summoning the EARTH Warriors or Beast-Warriors was good enough to finally get this card a spot in Forbidden land, which is honestly deserved considering its history now. Art: 3.5/5 Not the best artwork, but that glowing red really helps it stand out more. 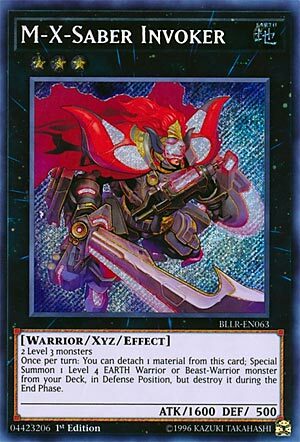 But anyway, you’re able to, once a turn, detach an XYZ Material from this card to Special Summon a Level 4 Beast-Warrior or Warrior Monster in Defense position from your Deck, and destroy it during the End Phase. It’s a combo card, because obviously getting that monster ON ITS OWN, isn’t going to do much for you. It’s what you do with it that matters. Using it in various OTK/FTK cycles, being able to bring out another XYZ, likely a generic Rank 4, or even more easily a Syncho or Link Summon, tribute fodder…all the usual possibilities, which make the point that it gets destroyed at the End Phase moot, as it won’t be around come then anyway. Makes the paltry attack not look so bad too, doesn’t it? Usable almost everywhere, I see why it warranted a Ban. Art: 4/5 Lots of nice color here, I like the sword it has, just like the art here in general.